ჩონჩხის თავის ქალა სიგარეტით (ნიდერლ. 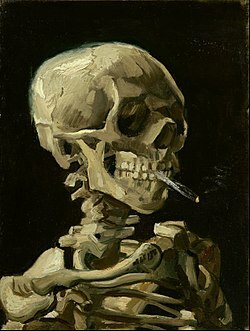 Kop van een skelet met brandende sigaret) — ნიდერლანდელი პოსტიმპრესიონისტი მხატვრის, ვინსენტ ვან გოგის ნახატი, შესრულებული ზეთის საღებავებით ტილოზე. ნახატი არ არის დათარიღებული, მაგრამ მისი შესრულების სავარაუდო თარიღია 1885-1886 წლების ზამთარი. ნახატი, რომელზეც გამოსახულია ჩონჩხის თავის ქალა ანთებული სიგარეტით, ვან გოგის მუზეუმის მუდმუვი კუთვნილებაა. იმ პერიოდში, როცა ნახატი შეიქმნა, ცნობილია, რომ ვან გოგი ანტვერპენის სამხატვრო აკადემიაში სწავლობდა და როგორც შემდეგ თქვა, გაკვეთილები და სასწავლო პროგრამა ძალიან მოსაწყენი იყო და არაფერს ასწავლიდა მას. ↑ Bundrick, Sheramy. (June 14, 2008) Memento Mori or Just a Joke?. Van Gogh's Chair (blog). blogspot.com. ციტატა: „[H]is letters and anecdotes from others record that he sparred with his drawing and painting teachers and was scornful of conservative academic practice. His time at the Academy lasted only weeks; he felt he was learning nothing and later proclaimed academic training "damned boring". Taken from that perspective, 'Skull of a Skeleton with Burning Cigarette' could be read as a thumbing-of-the-nose at 'the establishment. '“ წაკითხვის თარიღი: 2013-05-19.
ეს გვერდი ბოლოს დარედაქტირდა: 14:05, 9 იანვარი 2018.